Description: Theia Alderson has always led a sheltered life in the small California town of Serendipity Falls. But when a devastatingly handsome boy appears in the halls of her school, Theia knows she's seen Haden before- not around town, but in her dreams. My Thoughts: This is a book that cannot be missed. When I finished my first thought was "Nooo, that can't be it." followed closely by "Please, please tell me there is going to be a sequel." I'm torn, I love when books leave me with a sense of completion but I also love when books leave me wanting more. The story is mainly told through Theia's POV. There is a mix through the first part though told by third POV for Haden. While I liked getting something from him in those spots I wished it had also been through first person like Theia's part. This story was unique and unexpected. I thought when she saw the burning man fall from the sky that I knew who Haden was. I was wrong. I like that I got it wrong. Hayes does a wonderful job in creating this world. It is a beautiful love story and Theia and Haden both go through needed changes throughout. 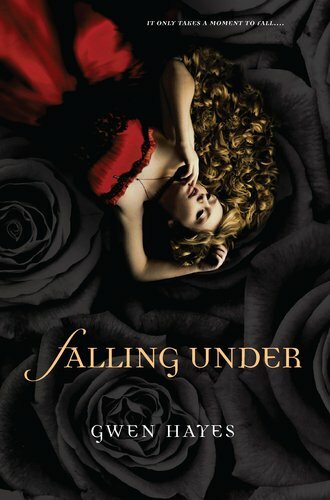 If you liked Twilight then you will like Falling Under. There is the danger of being together but there are no vampires. No one sparkles. Falling Under does set itself apart in a wonderful way. This is a book I will be reading again. This sounds great. Can't wait to read it! This is one I most definitely want to read. I love the cover as well. Great review! I really can't wait to read this one - the cover is beautiful and I've heard nothing but great reviews. Looks good. I love the cover. I just bought it and can't wait to read it. There's a burning man falling from the sky?!! Now I'm totally intrigued.